If there is no Wi-Fi or any other network connection present, there is the option to use a USB stick to synchronize data from and to the TimeMoto device. Within the software, select [Edit] > [Device]. Click the "Add" button at the top-right hand corner of the page to add a device manually. 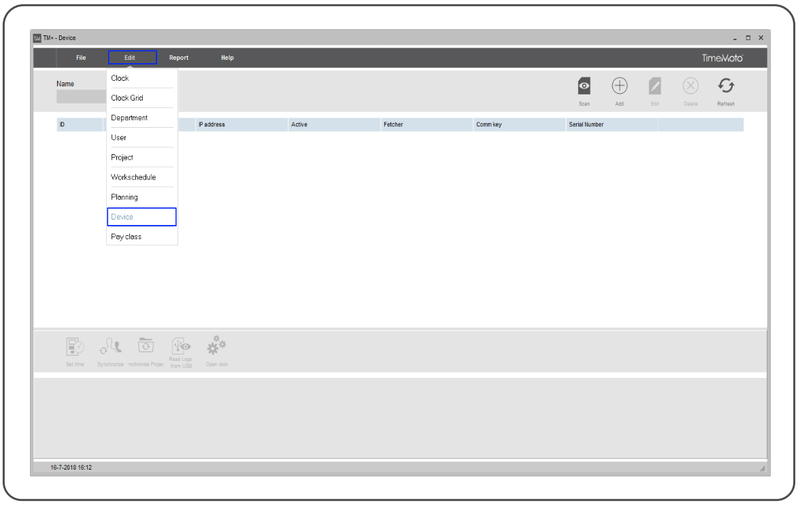 You can enter the device information into the fields as shown in the example below. Please leave the IP address field blank. This will allow the software to recognise that you are using a USB stick. Also, do not manually enter anything under "Fetching computer name", but press the "This computer"-button to fill it. Once the required fields are completed, click “OK” and the TimeMoto PC Software will scan the USB port regularly to check if a USB stick is present. 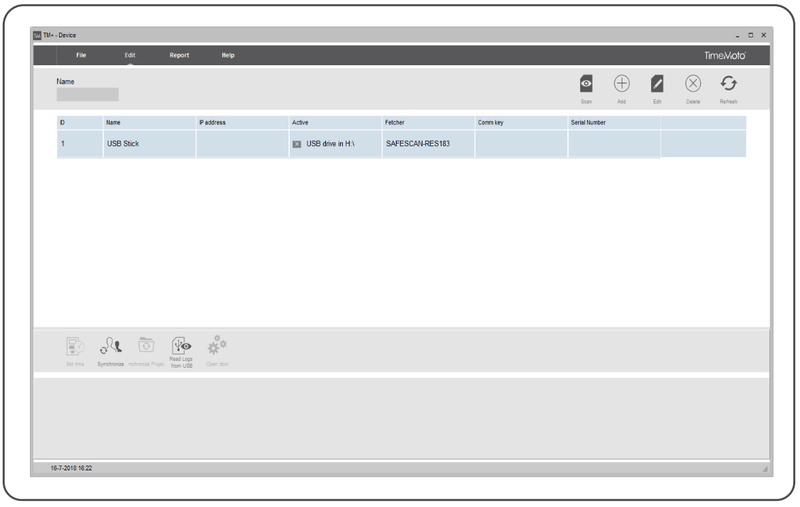 If a USB stick is found, the TimeMoto PC Software will show the drive the USB stick has been assigned to. Any attendance data will be loaded into the software automatically. 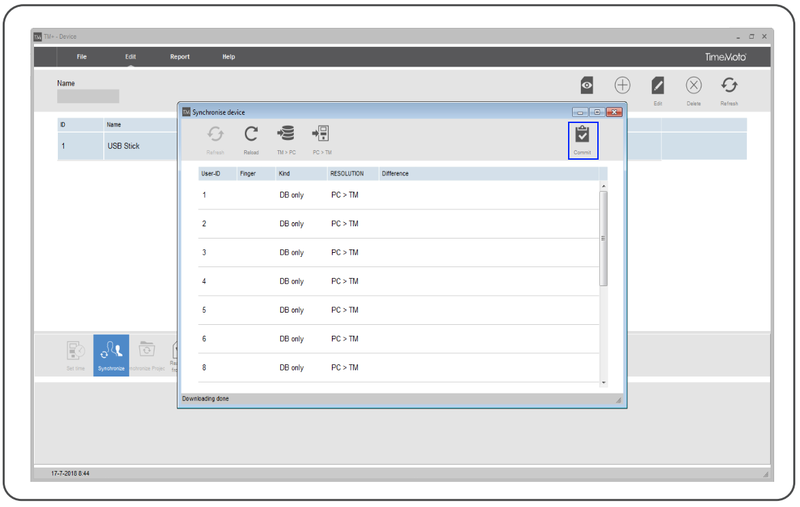 In order to synchronize the users that you have created in the TimeMoto PC Software, press the "Synchronize" button at the bottom-left hand side of the screen. A file browser will open. A file browser will open. Locate the USB stick on your PC drivers and select the "user.dat" file. If there is no such file, you can create an empty "user.dat" file now. Select your USB drive and click "Open". A message will appear confirming the creation of a new "user.dat" file. After confirming, a pop-up appear asking you if you use a TA-800 series device. Click "Yes" only if you are using a device from the older TA-800 series. If you use our current TimeMoto devices, click "No". You will see an overview of users present in the file, and those only present in the software. You will also see a list of differences between the file and the software (for example, a difference in password or fingerprints). From here, you can synchronize changes into different directions. You can also set how you want to transfer the user data per line by double-clicking the data under the “Resolution” tab. The icons at the top can also be used to set a general synchronisation into one direction for all lines. After you have set the synchronisation direction for each line, press the "Commit" button at the top right-hand corner in order to apply the changes.